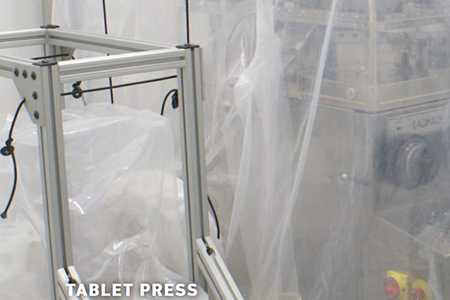 Tablet compression is a common operation throughout the pharmaceutical manufacturing industry. ILC Dover supplies a family of products that support contained Tablet Compression operations. The best approach is to totally encapsulate the coater with a floor pan mounted flexible enclosure. Integral glove sleeves are added to the enclosure to facilitate access to control panels and loading & unloading areas of the press. The enclosure is fabricated from our rugged ArmorFlex® family of films. Powder is fed to the press from a single use DoverPac® flexible container suspended above the press. 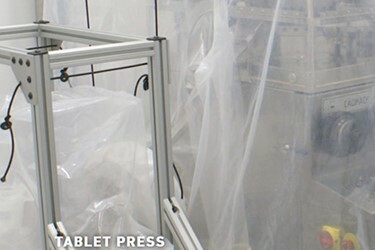 A bagout sleeve with CrimpLoc™ closures is used to remove finished tablets from the press and the enclosure.